A chest tube is a hollow plastic tube which is inserted into the chest cavity to drain air or fluid. Fluid in the chest may be blood (such as following surgery or trauma), pus (from an infection such as pneumonia), serous fluid, or contain cancer cells. Chest tubes are often inserted after lung surgery to remove fluids during healing. They can be inserted when a person is awake, with the use of local anesthetic, or during surgery. Complications may include pain, bleeding, infection, and a collapsed lung (pneumothorax). When an air leak or fluid accumulation persists despite having a chest tube in place, other procedures may be done to either prevent the reaccumulation or fluid or air into the pleural space. To re-expand the lungs when a lung collapses (pneumothorax). With a pneumothorax, the tube is inserted into the pleural cavity, the space between the membranes (pleura) that line the lungs. After surgery for lung cancer to drain fluids that remain in the space created after a portion of a lung is removed. With less invasive procedures, such as video-assisted thoracoscopic surgery (VATS) to perform a lumpectomy or other procedure, a chest tube may not be needed. When a chest tube is used after VATS, it may also be removed sooner (for example, often 48 hours) than for those who have a thoracotomy for lung cancer. After heart surgery, to remove fluids that accumulate in the chest. If there is bleeding into the chest (hemothorax), for example, from trauma. When a chest tube is inserted for a collapsed lung, a small area on the chest is numbed by using a local anesthetic. The tube is then inserted, and connected to a machine which uses suction to remove the air, thus allowing the lung to re-expand. The tube is sutured in place so it won’t pull out with movement. When a chest tube is inserted after surgery, it is placed under general anesthesia in the operating room. The tube is then connected to a container lower than the chest, using gravity to allow the excess fluids to drain. How Long Are They Left in Place? The amount of time a chest tube will remain in place can vary depending on the reason it is placed, and how long an air leak or fluid drainage continues. With a pneumothorax, doctors will look at an x-ray to make sure all of the air has been removed, and the lung has expanded completely. Following lung cancer surgery, the tube will be left in place until only minimal drainage remains, often a period of three to four days. Sometimes a leak persists and other options must be considered (see below). A persistent air leak after chest surgery can be frustrating, but most resolve on their own in time without further treatment. Removal of a chest tube is usually a fairly easy procedure and can be done comfortably in your hospital bed without any anesthesia. The sutures are separated and the tube is then clamped. Your doctor will ask you to take a breath and hold it, and the tube is pulled out. The suture is then tied to close the wound and a dressing applied. If the tube was placed for a collapsed lung, an x-ray will be done to make sure your lung remains expanded after removal. Bleeding: Sometimes blood vessels are "nicked" while inserting the chest tube. 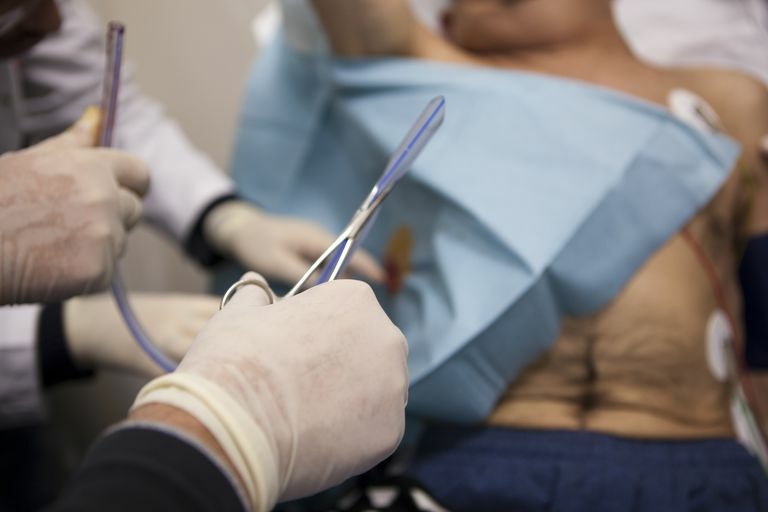 If bleeding persists, surgery may be needed to cauterize the vessels. Infection: Any time an instrument is introduced through the skin, there is a small risk of infection. The risk of infection increases with the longer the tube is left in place. Pain: Though the area through which a chest tube is placed is anesthetized, it is difficult to totally numb the area through which a chest tube is inserted. In addition, local anesthetics will not remove the sense of pulling as the tube is inserted. Poor tube placement (some pleural effusions are "loculated," in other words, have several small collections of water, pus, or blood, which is separated by tissue. When this is the case a chest tube may only drain that collection of fluid in the area where the chest tube is placed. Pneumothorax: A chest tube is often inserted to release air from a collapsed lung, but may also puncture a lung resulting in a pneumothorax. A lung which has been collapsed may also collapse again when the tube is removed. Other structures in the vicinity of the chest tube may be injured, such as the esophagus, stomach, lung, or diaphragm. Pleural effusions are very common in people with lung cancer and commonly occur with metastatic breast cancer as well. In a pleural effusion, fluid builds up in the pleural space, the area between the two pleural membranes that line the lungs.This space usually contains only three to four teaspoons of fluid, but with lung cancer, several liters of fluid may accumulate, or re-accumulate, quite rapidly. When cancer cells are present in a pleural effusion, it is termed a malignant pleural effusion. If a malignant pleural effusion is present, it categorizes lung cancer as stage 4. Many people with lung cancer end up having recurrent pleural effusions—and even though these are often benign, the pressure on the lungs from excess fluid causes pain and shortness of breath. Another option for recurrent pleural effusions is to scar down the space between the two pleural membranes.This procedure is called a pleurodesis and is done in the operating room under general anesthetic. When the layers of the pleura scar together, it obliterates the pleural space so that there is no longer a cavity available for which fluids to collect. Having a chest tube in place no matter the reason is very frustrating. For whatever reason air or fluid has accumulated in the pleural space, the time waiting for it to resolve and not knowing is difficult both for patients and their loved ones. Talk to your doctor about your feelings, and ask for an estimate on the time it will be left in place. Be your own advocate and ask questions. Medicine is changing and patients and physicians are working much more closely together than in the past when it comes to making decisions about health care options. Deng, B., Qian, K., Zhou, J., Tan, Q., and R. Wang. Optimization of Chest Tube Management to Expedite Rehabilitation of Lung Cancer Patients After Video-Assisted Thoracic Surgery: A Meta-Analysis and Systematic Review. World Journal of Surgery. 2017 Mar 13. (Epub ahead of print).